HomeNewsIs Waterboarding Torture? The Resounding And Definitive Answer Is Yes. With Donald Trump’s recent statements in favor of waterboarding, the controversial form of torture is back in the spotlight. 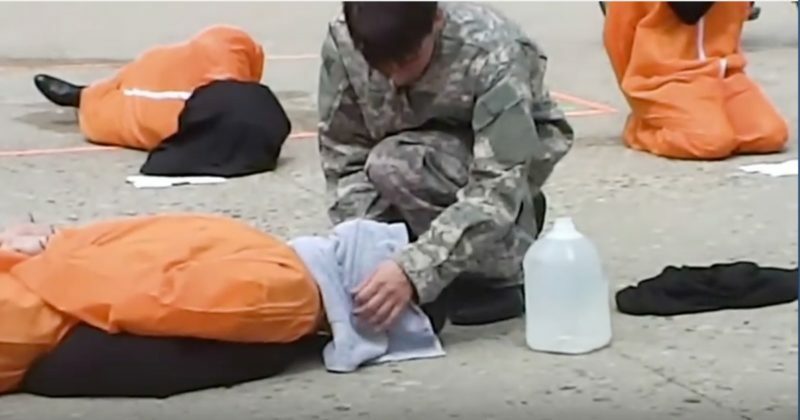 Despite a 2014 Senate Report which found CIA interrogation tactics mostly ineffective, many (including President Trump) are eager to waterboarding as an “enhanced interrogation” tactic once again. In this article, I’ll answer the following questions: is waterboarding torture and should we use it as an interrogation tactic once again? Is Waterboarding Torture? Let’s Ask The People Who Have Experienced It. Most of the people who defend waterboarding or say it’s not torture are people who have never experienced waterboarding. Perhaps most notably is Sean Hannity, the FOX News Anchor who promised in 2009 to get waterboarded for a charity event. Seven years later, Hannity’s actions still do not speak louder than his words. Fortunately, Christopher Hitchens, Daniel Levin, Erich “Mancow” Muller, and John McCain can provide us a little perspective on the matter. The late Christopher Hitchens, a distinguish author and intellectual, was an ardent, and sometimes stubborn, supporter of the Iraq War, but was never specific on how he felt about waterboarding. So, he decided experience waterboarding firsthand and wrote an article in Vanity Fair detailing the experience. So, Mr. Hitchens, is waterboarding torture? Watch for yourself. His peers did not like this response, and Levin was forced out of the Justice Department in early 2005. In more recent days, Erich “Mancow” Muller, a conservative radio host and supporter of waterboarding, put his money where his mouth and got waterboarded. What was Muller’s conclusion? Is waterboarding torture? See for yourself. Fortunately for Americans opposed to waterboarding, Trump has strong opponents in both his cabinet and the Senate. Perhaps the most vocal Republican on the issue is John McCain, a former prisoner of war and decorated veteran. Trump’s own Secretary of Defense, James “Mad Dog” Mattis, is also opposed to torture. Trump has already stated that he will let Mattis make the final decision on torture, so it doesn’t seem like torture will make a return under Trump. On the issue of waterboarding specifically, Mattis has stated that he will not order waterboarding. The Verdict: Is Waterboarding Torture? Those who have been waterboarded have unanimously said yes, waterboarding is torture. It’s easy for people to sit back and call for waterboarding on others, but the reality is that waterboarding is torturous and ineffective. The United States would be foolish to use waterboarding, or any other form of torture, as an interrogation tactic in the war on terror.